As you know, we’ve been stuck at 198 birds for a couple of weeks now. We added a bunch of good new birds on the Farallones trip, but it’s been very quiet since then. The summer doldrums are upon us, and newcomers showing up at the bird feeder are not expected. The Resident Expert and I decided to go out and look for some, since they weren’t coming to us. 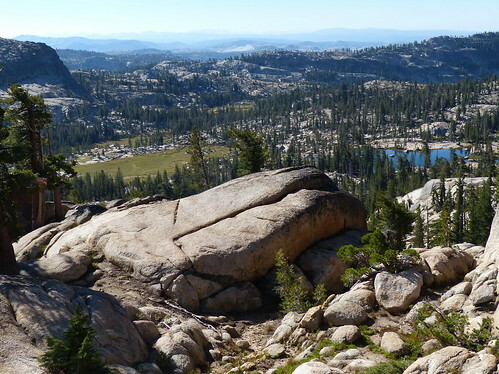 Destination: The Emigrant Wilderness. We were up here in the early summer and snagged some List birds on a day hike out to Bear Lake, and even with the Doldrums going on I figured we’d find a new bird or two up here. And we were backpacking, so we’d stand a better chance of being outside for the dawn and dusk bird shows. Early Saturday morning we made our way up the dirt road to the Gianelli Cabin Trailhead. At one point a family of quail ran across the road, displaying very conspicuous topknots. That got the Day List off to an official start, with the California Quail being the state bird and all. But hold on a minute: the CA Quail doesn’t range up this high – these are Mountain Quail, and they are now registered at number 199 on the Life List. We pull into the dusty parking lot, and now the likelihood of reaching the 200 bird plateau is looking pretty good. I step out of the Forester, and right in front of us I see what appears to be a piece of bark moving up the side of a pine tree. Could it be? Yes it could. 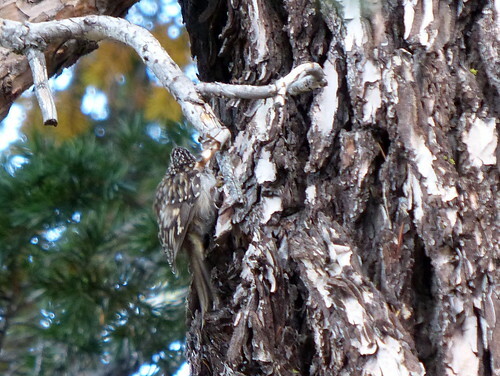 That’s the Brown Creeper, blending in real good on the left side of the tree. You can’t hide from us, little guy. Step forward and accept your Bird #200 recognition. The thing is, I’ve been looking for this bird in our back yard all year, after learning of the existence of the Brown Creeper. They walk up the sides of pine trees and eat bugs along the way. Our neighbor has a large pine tree that’s perfectly situated for the leisure-oriented backyard birder to observe. And I have observed that tree, and have seen lots of birds in it, but not this one. We’re not even on the trail yet, and we’ve added our 200th bird to the List. Pressure’s off! Before the March to 300 begins, let’s take a look back at some of the notable birds in the second century. The rarest bird seen so far is the Great Gray Owl that we encountered in Yosemite. I told you about it earlier. What I haven’t told you, because I’ve only just discovered this recently, is that our sighting of the owl may have caused a minor stir. There are probably less than 200 of these birds in California, so it’s a tough get. Many birders make the trek to Yosemite and search for it at Westfall Meadow and its other known haunts. 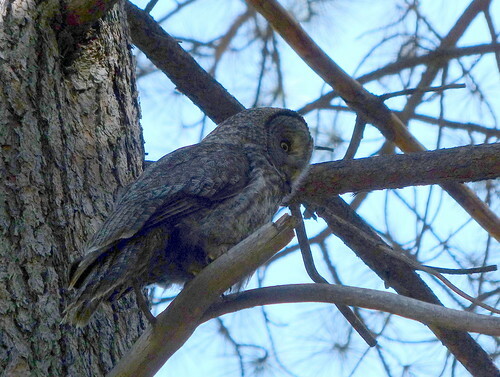 I told a former Yosemite park ranger that I’d seen it at Wawona Meadow when we were heading home from our trip, and she said they hadn’t seen the Great Gray Owl there for a couple of years. So I checked recently on eBird, and the data confirm this. Just like she said, no birds after 2012, until our sighting this past March. And the next sighting after that is by teen birding phenom Logan Kahle, who we met a few weeks ago on our Farallones trip. He’s doing a California Big Year, and the Great Gray would be a difficult but essential bird for that list. He was at 417 a few weeks ago, so you could say one more bird wouldn’t make a huge difference. But let’s face it: he needed this bird. EBird says there are only four other locations in the state where it’s been seen this year, and just single birds (and no photos) in each case. I included the picture you see here in my eBird checklist so there would be no question of mistaken identity. There have been numerous sightings at Wawona since then, as recently as three weeks ago. They’re probably still there. 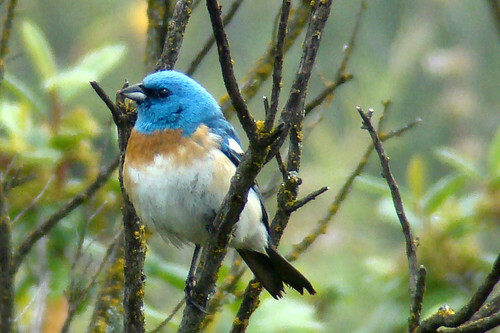 Another memorable bird in the second hundred is the Lazuli Bunting. It’s one that I’d been on the lookout for, and several times tried to convince myself that I’d seen it, when in fact I was looking at a Western Bluebird. The Bunting isn’t here year-round, so time is of the essence if you want to see it. By May they’re mostly gone, off to their summer home in the Intermountain West. In early May we made a last-ditch effort to find it, and eBird told me it was seen at Windy Hill. We pulled into the parking lot, I stepped out of the car, and perched atop a shrub in front of me is the Lazuli Bunting. He looked straight at me, then pivoted left, then right, apparently so that I could be absolutely sure of the ID. And there’s no mistaking this bird for a Western Bluebird, now that I’ve seen it. No disrespect intended for the bluebird, who I greatly admire, but the bunting is a knock-out. Creative Commons image courtesy of Maggie Smith on Flickr. I hope to see this bird again next spring, but I suppose I’ll start looking for it earlier.